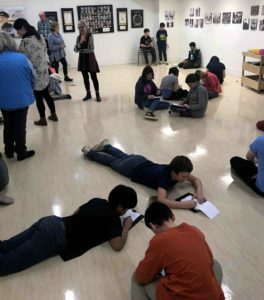 February 20, 2018 – Students visit Reminiscences exhibit. Posted on February 22, 2018 by admin | Comments Off on February 20, 2018 – Students visit Reminiscences exhibit. 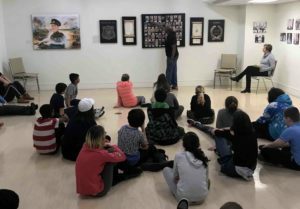 This is the first of groups of local area students who will be visiting the Community Room exhibit and hearing the inspiring story of its creation and the people represented. Chuck Smith, on of the creator’s of the show was on hand to give his ‘first hand’ experience of growing up in Yarmouth African Nova Scotian community. He personally knew or is related to many of the portraits and photographs. Dan Earle gave a short presentation on looking at portrait painting from the artist’s viewpoint and the students did some quick studies. 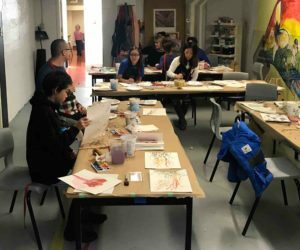 Comments Off on February 20, 2018 – Students visit Reminiscences exhibit. The Family Sunday event, Water-Colour with Dan Earle vent very well. The morning snowfall did not hold back the 12 registered participants that included elementary, high school students and parents. Dan stressed “water” as being the key word to remember in watercolour and talked about colour mixing, density and the importance of letting the water do the work. He did demonstrations and coached individuals. All seemed pleased with the event and the waiting list indicates further watercolour interest. The opening of the Reminiscences show was held at the Community Room of the AGNS. It was attended by over 100 people. 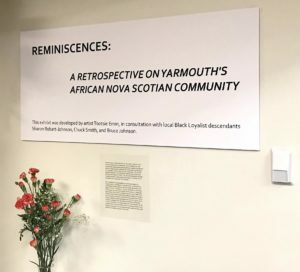 Presentations were made to introduce and honour the show and its contribution to the history of the African Nova Scotian Community and the Town of Yarmouth.